Famous author Zane Grey came to the Bay of Islands, New Zealand back in the 1920’s. While he was here, he wrote his infamous book ‘Anglers Eldorado’, which in turn lead to the Bay of Islands becoming a renowned big game fishing destination. Zane Grey captured many Striped Marlin before finally getting a giant Black Marlin to bite a swimming bait. 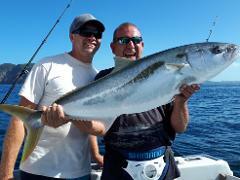 It wasn’t long before he got another fish to bite, but this time it was a Pacific Blue Marlin. These tales have brought some of the world’s top anglers to the Bay of Islands where they too have had battles that have lasted 5 hours plus. Striped Marlin, Blue and Black Marlin up to 1000 pounds and more, some have won the fight and some have lost, but to this day the stories remain. These magnificent fish swim in our waters from early December to the end of May each year, challenging locals and tourists alike to try their luck. 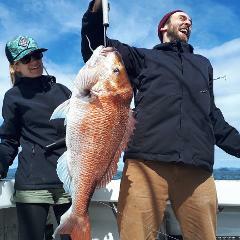 So, when is our best time for big game fishing and pelagic fish in New Zealand? The big game fishing season has not really changed a lot over the last 25 years that I have lived in the Bay of Islands. I have seen a late start to the season because of the wind directions, or the way the current has flowed, but really it is nearly always around late December to early January. This is when we start to see the first fish being caught or tagged and released. The best time in my opinion has always been between late January to late March, this is when the warm northerly current called the East Auckland current is in full swing and has spread nutrient rich blue water throughout the area. This brings many life forms, including pelagic species, with it and a lot of different bait for the marlin and tuna to feed on. In the past few years, with all the talk of climate change and global warming, there has been a slight change of timing where the marlin seem to be around in good numbers late into the season, right into April and May. There are many Striped Marlin being played and caught or tagged and released every day in an area not too far from the bay, where they seem to be very concentrated in numbers. Nobody really knows why, but it makes for great fishing if you can be there when they bite! 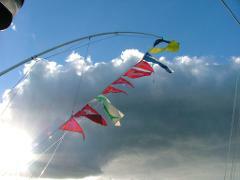 There are fish that have been caught and weighed with weights exceeding 400 pounds. Every year at some point in time there are always a few Black Marlin caught or seen from the Harauki Gulf to the top of the North Island or the Three Kings Islands, usually these beasts are seen around structured areas of reef or deep headland areas where the food is in abundance and the rich nutrient waters flow by. Black Marlin can’t resist a good old skip bait or a bright lure that swims by. Although common, the Black Marlin are probably the most unseen marlin in New Zealand waters. The big Blue Marlin are a different story, these can be caught in water from 100 metres to 1000 or more. An average depth is around the 400 metre mark in most cases, but then again, this season we had a great period catching or tagging and releasing a number of these beautiful fish at an average depth of 250 metres with an average size of 500 pounds plus. The Blue Marlin love their Mahi Mahi or Skipjack Tuna for breakfast so if you can find these in a warm patch be very careful, a big old blue could be lurking somewhere close by. After re-naming the boat ‘Wildblue’ and the company name being Wildblue Adventures Limited, we were very happy to have caught the heaviest billfish for the Truckers and Loggers Fishing Tournament 2018, a large Blue Marlin of 213 kg. This fish was a very tough one to catch, probably one of my hardest. After five long hours of fighting hard this fish still had lots of life at the boat – a challenge I’ll never forget.